Born: 1888, St. Mary Elm’s, Ipswich. Died: 1932, Ipswich; age: 44, of a Heart Attack, at 9, Kelly Road, Ipswich. Residence: 9, Kelly Road, Ipswich. 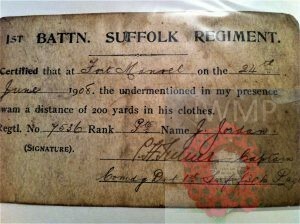 Enlisted: 1907 – aged 19 – Suffolk Regiment, 1st Battalion. Malta – learned trade as a Tailor. PoW following the Battle of Cambrai – Dülmen PoW Camp, Coesfeld, North Rhine-Westphalia, Germany. Wounded three times – left service with shrapnel embedded in his shoulder. 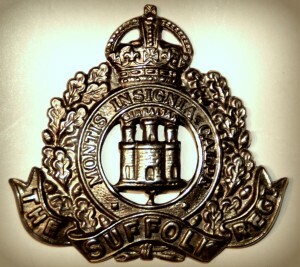 Medals Awarded: Victory, British War & 1915 Star + Military Medal – with the 7th Battalion, Suffolk Regiment. 1891 29, The Mount, Ipswich. James was 2 years old and living with his parents & siblings. 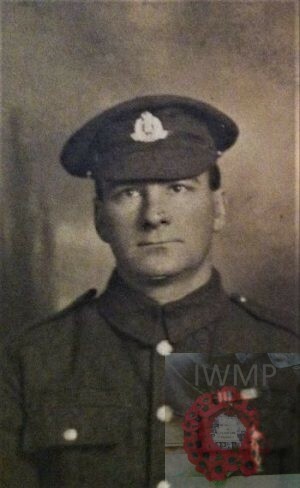 John William Jordan, 39, a Sanitary Labourer – Drains, born Ipswich. Emily Jane Jordan (nee Page), 39, born Tattingstone, Suffolk. Emma Jane Jordan, 18, a Stay Box Maker, born Ipswich. William Thomas Jordan, 17, a Bricklayer’s Labourer, born Ipswich. Emily Jane Jordan, 15, a Stay Box Maker, born Ipswich. Ellen Jordan, 13, born Ipswich. Georgina Jordan, 11, born Ipswich. John William Jordan, 9, born Ipswich. Alfred Jordan, 7, born Ipswich. George Henry Jordan, 6, born Ipswich. Thomas Jordan, 5, born Ipswich. Emily Jordan, 4, born Ipswich. 1901 1, Portman Road, Ipswich. James was 12 years old and living with his parents, siblings, brother-in-law & niece. John, 49, a Sanitary Labourer – Drains. Thomas, 16, a Quay Labourer. Alice Maud Jordan, 8, born Ipswich. Benjamin Jordan, 7, born Ipswich. Beatrice Ethel Jordan, born Ipswich. Ellen Grist (nee Jordan), 25. Herbert William Grist, 21, born Ipswich. Beatrice Emily Grist, 10 months, born Ipswich. 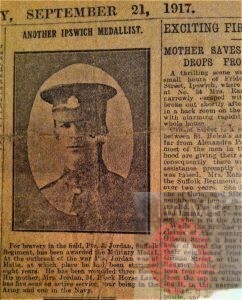 James was 22 years old, a Soldier ranked Private, for the 1st Battalion of the Suffolk Regiment. His trade was Tailor. James’s father, John William Jordan died 1921, Ipswich. Jean J. Jordan, born 1930, Ipswich. Ronald J. Jordan, born 1932, Ipswich – died 1938, Ipswich. Jim was christened Henry James Jordan but was known all his life as James Henry, shortened to Jim. He was about the 13th child of Emily and John William Jordan, who were living at that time at 15 Handford Road, Ipswich. John William was, according to family legend, a larger-than-life character who worked on the ‘bumby’ or Night Soil carts. In 1907 Jim enlisted into the Suffolk Regiment, spent a few weeks at Woolwich Barracks and then, probably to his great delight, found himself on the troopship ‘Dongola’ bound for Malta, arriving in Valetta Harbour on November 27th 1907. 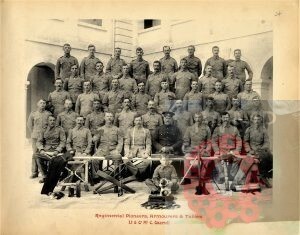 There were two barracks on Malta, and from the photographs of ‘B’ Company, we believe he was stationed at Fort Manoel. 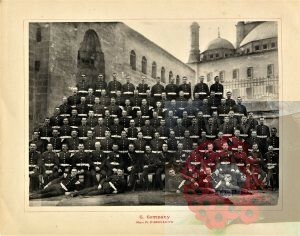 He can be seen on the photograph of the Armourers, Pioneers and Tailors, third from the left, second row from the front. He was trained by the army to be a tailor and my mother can remember a brown velvet dress he made for her second birthday. The journal detailing life in the First Suffolks during these years in Malta is to be found in the Record Museum in Bury St Edmunds. Life seemed to consist of football, cricket, tug of war, water polo and bayonet fighting. We have a certificate showing that Jim learned to swim in the warm waters of Valetta Harbour – 200 yards in full clothing! Jim is referred to once in the journal, he was part of a shooting team that won a competition and he won the princely sum of seven shillings and sixpence. Cairo in about 1912. Jim is third row back, fifth from right. Three years later the Battalion were on the move, this time taking over from the First Welsh at Mustapha Pasha Barracks in Alexandria. Some men went off on camel training but Jim’s life continued much as before; sports, training and parades. When war broke out in Europe the battalion was stationed in Khartoum; they were quickly ferried back to England, arriving in Liverpool in October 1914. Jim had three days leave which he spent at the family home, now 34 Black Horse Lane where his mother Emily ran a corner shop. Two older brothers who were reservists had already left home; Bill, a brother considerably older than Jim, had been accepted into the Home Guard, but younger brother Ben had not yet joined up. (He was later to join the Navy and served on the Royal Oak during the Battle of Jutland). It was January 1915 when Jim found himself for the first time on French soil. The weather was cold and wet and it didn’t take long for the mens’ boots to start to disintegrate. From the hot winds of Khartoum to the freezing mud of ‘Wipers‘ – it must have come as a shock. Jim’s war records were destroyed during the Second World War so we have made educated guesses as to his experiences during the course of the war. We know he was wounded three times and we know that he was not on active service when the Battalion was transferred to Salonika at the end of 1915, he must have been recuperating from an injury at the time. We know that from early 1916 Jim was in the Second Battalion – in April they were assigned trench digging duties in the Ypres Salient and in September that year they were involved in the Battle of Loos. By April 1917 the unit were fighting in the Battle of Arras. 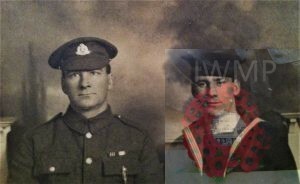 We know Jim was in the 7th Battalion when they marched underground into the caves underneath the town at Easter 1917. Some time during September 1917 Jim was awarded the Military Medal. Perhaps he was a volunteer for the raids on enemy trenches that went on during that period. Unfortunately we will never know. During this autumn period, the Battalion took part in the Battle of Cambrai, in which tanks were used for the first time. On November 29th the men were exhausted. They were relieved and moved back to a sunken road less than half a mile from the front line. That night, Jim and his comrades were captured by the Germans, and forced to march miles behind enemy lines. In January 1918 Jim is on the official register for Dulmen prisoner of war camp, although it is more likely that he was one of thousands forced to work behind the German front line. He pops up again in April 1918, on the register for Friedrichsfeld camp. The Red Cross record shows that he had injuries to his left shoulder and left thigh. Family legend has it that Jim suffered from lack of medical attention and hunger during the year he was a POW and that it was this that probably led to an early death. Back home in Ipswich Jim found work with his brother Bill on a building site. He met and married Maudie Crane in 1922 and after a few months living with his in-laws in Bath Street, moved into a newly built Council home – 9 Kelly Road. I believe Jim and Maudie were very happy at Kelly Road. They both loved nothing more than a sing-song at the local pub. Jim kept canaries and filled his small garden with daffodils, a flower he loved. Apparently he was a very happy-go-lucky chap, who enjoyed a laugh and a chat. He could stick up for himself though. When a brother-in-law (one who had shirked war duties and couldn’t hold down a job) poked fun at Jim as, after several years, there were still no children, Jim gave him a black eye! Eventually Jean was born, in 1930 and Ronnie in 1932. By then, Jim had had to give up work due to a diseased heart. He spent his time making clothes and thick rag rugs, looking after the children and his beloved canaries. One sunny day in May 1932 Jim decided to cut the hedge that ran along the back garden. It was here that he suffered a fatal heart attack. He is buried in an unmarked grave in Ipswich Cemetery, only a few steps from the Garden of Remembrance.